Magnetic inductive testing of cables is designed to ensure safety of aerial cableways by detecting wire fractures caused by wear and corrosion to carrying, traction and hoisting cables. The difference between indications of fractures and corrosion of the wires is often difficult to detect when the cable is fully sealed and it is seldom achieved with absolute certainty. The evaluation is subjective and requires considerable experience. 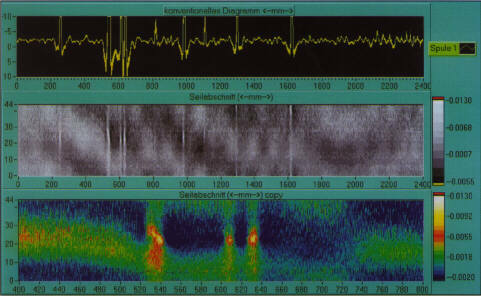 Usually the decision as to whether a cable can continue in service is decided on the basis of radiography images. This a rather costly procedure and not without problems because of safety requirements (handling of strong radioactive sources) and due to the exposed working conditions with aerial cableways. This test method therefore demand teams that are well trained and well equipped. Up till now the measurement of the scatter field produced by damage in a cable has been carried out either cumulatively around the complete circumference of the cable, either split into two 180° sectors or into 4 overlapping 180° sectors. Nowadays the detailed measurement of the magnetic scatter field of a wire cable, divided it into 24 to 60 sectors, depending on the diameter, is made possible by using the Hall effect in semiconductors combined with the increasing processing capacity of a personal computer. The image of the high resolution magnetic scatter field and the wide range of data processing facilities provide a new basis for decision making. In the following sections the two previously used test procedures are described and this new imaging method is introduced. Non-homogeneity in the cable generates magnetic scatter fields which are detected by the measuring coil cumulatively over the complete circumference of the cable. Any faults can be seen on the graphic display which indicates any wire fractures, corrosion or other damage. The radiographic test method illustrates the volume density of a test body in a two dimensional image. Gamma rays radiated by a radioactive isotope penetrate the cable and expose, in a more or less attenuated form, an x-ray film placed on the other side of the cable. Small wires fractures, corrosion and damage cannot normally be detected. Based on experience it can be stated that using the radiographic test method between 10% and 30% of wire fractures remain undetected. Using this test method magnetic scatter fields on the cable's surface are detected and displayed with a high resolution. The measurement data can be processed and illustrated in many ways (which will be shown in the following sections). Because magnetic fields follow the path with the least resistance, in our opinion, this cannot be described as tomography, even though the results of the scatter field images are often shown as three-dimensional figures. A carrying cable is tested by the measuring device travelling along it, while the hoist and traction cables are transported through the stationary measurement device. 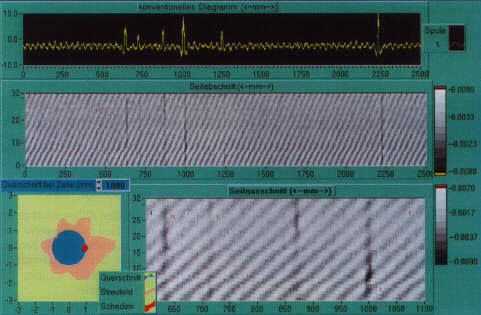 Initially the voltages developed by the hall probes are measured and recorded in steps of 0.6 mm along the cable. The image of the scatter field is made along the axis of the cable. The image of the surface of the unrolled cable is generated from the data collected around the circumference of the cable. The numerical values can be processed in many ways and prepared as grey tone pictures, false colour pictures or relief illustrations. The illustration above shows a homogeneous magnetic scatter field both in the middle of the wire fracture and in the section of the cable which has no fractured wires. Therefore a measurement of the cross-sectional losses or a calibration of the cross-sectional measurement is possible. The visible scatter field permits the measurement of the cross-section with knowledge of the actual conditions, so that it is no longer considered as a "blind" measurement. Experience will show to what extent measurements have to be corrected in homogeneous scatter fields. Scatter fields in two cross-sections through the carrying cable, the difference in the two fields corresponds to the cross-section of the fractured wire (1.7% of the cable's cross-section). Detection and assessment of internal damage, however, is more difficult. How is it possible to differentiate between internal wire fractures and welding joints? How well can internal wire fractures overlaid by internal or external corrosion be detected? A great deal of experience is not yet available in this field. Nevertheless the testing of aerial cables relies to a great extent on experience because the test instrument only provides information on the condition indirectly via the magnetic scatter field produced in the cable. The following examples, however, show that the ability to detect faults is probably superior to that of the radiographic method. Example 2: carrying cable, 46 mm diameter, with 4 internal wire fractures 36 Hall probes around the circumference, section of cable 1.4 m long, width of fracture 1-3.5 mm (determined by gamma radiography; when the width of the fracture is small, the scatter field is proportional to the distance between the wire ends of the fracture), proportion of the cross-section for a broken wire is 0.92%. 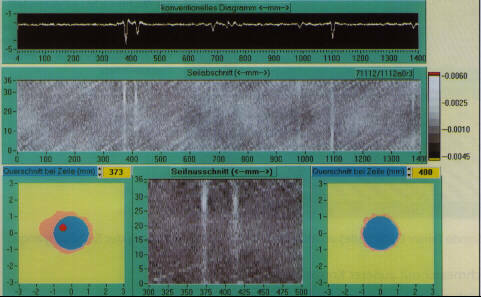 Upper figure: conventional magnetic inductive test signal Middle figure: high resolution detection of scatter field, 5 internal wire fractures (perpendicular lines) and gradient of the outer layer (inclined texture). Lower figures: cross-section through the cable with scatter field and (where applicable) the calculated position of the wire fracture, in the centre magnification of two wire fractures. 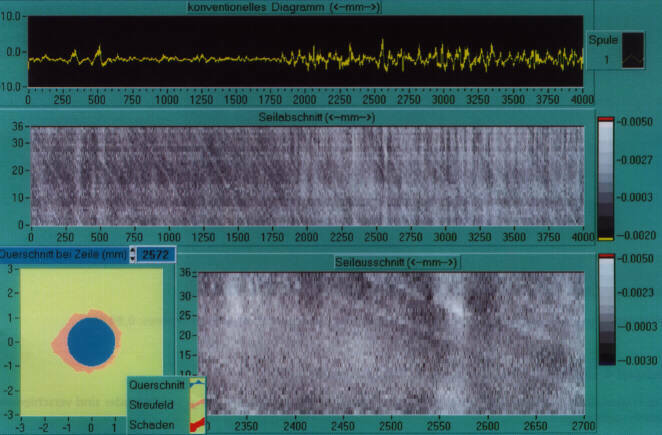 Middle figure: high resolution detection of scatter field, 9 internal wire fractures (vertical lines). Upper figure left: scatter field in the cross-section of the cable, the strand with the wire fracture is clearly visible. The calculated position of the wire fracture is illustrated. Lower figure right: magnified section 600 - 1300 mm of the upper figure, showing 5 internal wire fractures which are distributed over 3 strands and then over different wires. The evaluation of a single test probe (one data line) permits continuous measurement of the lay of the cable. Example 5: carrying cable, 47 mm diameter, with external corrosion 36 Hall probes around the circumference, section of cable 3 m long with local corrosion. The question is: Are the external indications of corrosion covering up possible indications of wire fractures? The high resolution scatter field display (below, right) and the flat distribution of the magnetic scatter fields in the illustration on the left side indicate that there are no wire fractures present. In order to limit the amount of accumulated data, initially conventional magnet induction methods are used to test the cables of an aerial cableway. When using this method damage is detected that needs further investigation, image producing methods are used. Because this can be carried out directly after the regular tests using the same instruments, costs are kept to a minimum. Until sufficient experience has been gained with the imaging method, it will be necessary to decide from case to case whether the radiographic test method is also necessary. The high resolution magnetic-inductive test method described here supplements the results achieved by conventional test methods. Initial experience with the new method has produced surprisingly good results. Up till now additional tests using radiographics have not been necessary. The ability to differentiate between damage caused by corrosion and wire fractures in fully sealed cables has been improved. A decisive step has been made to increase safety in aerial cableways.